Double defeats at the hands of Sheffield Steelers have left Milton Keynes Lightning firmly rooted to the bottom of the Elite League. With 20 games to play, qualification for the end of season play-off is still mathematically possible after Sunday’s narrow 2-1 loss at the FlyDSA Arena – but it relies on the three teams above MK hitting a losing streak and a big improvement in results for Tim Wallace and Ryan Lannon’s outfit. After the defeat at Steelers there is a 13 point gap between MK and Coventry Blaze and Sheffield plus a 14 point difference with Manchester Storm who occupy the final play off spot. It followed a 4-1 loss to Steelers at Planet Ice on Saturday. MK’s plight was not helped by injuries to Martin Mazanec, Trevor Morbeck and David Norris which left the squad seriously depleted at the weekend – especially so after the departure of defenceman Clay Anderson early in the month. There was an early powerplay opportunity for Lightning when Steelers’ man of the match Anthony DeLuca was penalised for delaying the game after just 1min 38secs. But the home side were able to keep the visitors at bay and it was the hosts who went in front on 5mins 7secs. Tanner Eberle was the provider as DeLuca made amends for his misdemeanour with the go ahead goal. 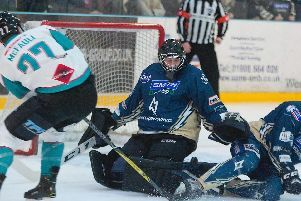 Pressure on Sheffield net saw netminder Jackson Whistle make a couple of great saves before the puck ran loose and Nelson Armstrong was able to set up Andreas Valdix to score against his old employers for the second period equaliser on 27mins 6secs. The celebrations were cut short though when Steelers captain Jonathan Phillips fired past goalie Patrick Killeen to edge his team in front again on 28mins 55secs. That was the end of the scoring despite a last gasp bid for an equaliser MK pulled Killeen for the extra skater and then called a timeout but Steelers held on for the precious points which saw them climb one place in the table and Lightning’s winless streak stretch to six games. The previous evening at Planet Ice it took until the final few minutes for Steelers to stamp their authority on a game in which they were the better side from the start. Steelers, uncharacteristically only one spot above their bottom placed hosts, outshot MK 15-6 in the first period – yet for all that they could not find the net with goalie Patrick Killeen once again performing heroics to blunt the Sheffield challenge. There was just one penalty called in the opening 20 minutes – Lightning given the man advantage when Anthony DeLuca was called for slashing in 12th minute. But it looked as though MK were defending a powerplay rather than going on the offensive as they were pinned back in their own zone until the final few seconds when Robbie Baillargeon was finally able to put a shot on Jackson Whistle in the opposition goal. 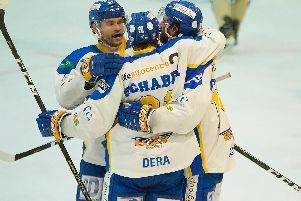 Sheffield sought to press with John Armstrong, Josh Pitt, Aaron Johnson and Jordan Owens all testing Killeen before the break – an aborted Andreas Valdix-led attack being the best MK could manage in the final minute. Going into the second session Killeen was eventually caught out by Tom Zanoski, debuting for Steelers following his signing two days earlier. The Croatian-Canadian dual national fired to the left to give the visitors the lead on 30mins 23secs. Less than a minute later Tim Wallace was penalised for holding – a strange call which should have been preceded by an icing call against Steelers. Unperturbed it was Lightning who broke short-handed with Valdix feeding Baillargeon to tuck the puck away for the equaliser on 32mins 56secs. That’s the way the score remained at the second break but nevertheless it looked as though Steelers were the more likely winners. And so it proved – even though it was not until 53mins 58secs that they went ahead when Robert Dowd was credited with having the final touch on a rocket from the blue line by fellow Great Britain team-mate Ben O’Connor. Lightning’s fate was to all intents and purposes sealed then – if not it certainly was after Wallace was sent to the cooler for hooking in the 56th minute – Dowd finishing off on the powerplay at 57mins 41secs. MK withdrew Killeen for the extra skater with 1min 6secs remaining with the wrong result as Owens fired home on the empty net to make it 4-1 with 14 seconds remaining – Baillargeon’s frustration earning him a game misconduct penalty for abuse of an official at the same time.